Julie and I began working together in June 2010. 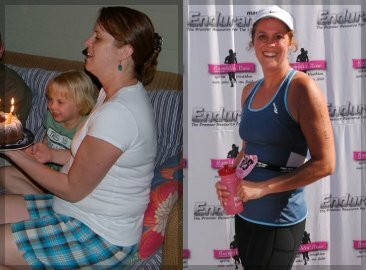 A busy professional for a Fortune 500 company and a mother of three, Julie’s weight and conditioning had yo-yo’d up and down throughout her pregnancies, despite regular exercise. She became inspired by the progress a friend made and wanted to lose some of her remaining “baby weight” as well. Well, she did that and then some. Julie has lost 3 dress sizes and counting, along with several pounds of body fat, using the nutritional and training strategies we laid out. In addition to our time together, Julie incorporates interval training on her own in the form of cycling, running and kettle bell circuits. She can also be found at boot camp class on Saturday mornings kicking some serious asphalt. This past October, Julie completed her first triathlon – Ramblin’ Rose Chapel Hill. Julie never backs away from a challenge and continues to push herself to the limit each day. She is an inspiration to many and is proof that you can attain any goal you make for yourself. Believe me – if someone with Julie’s schedule can do it, anyone can! Great work, Julie! It’s a pleasure working with you!